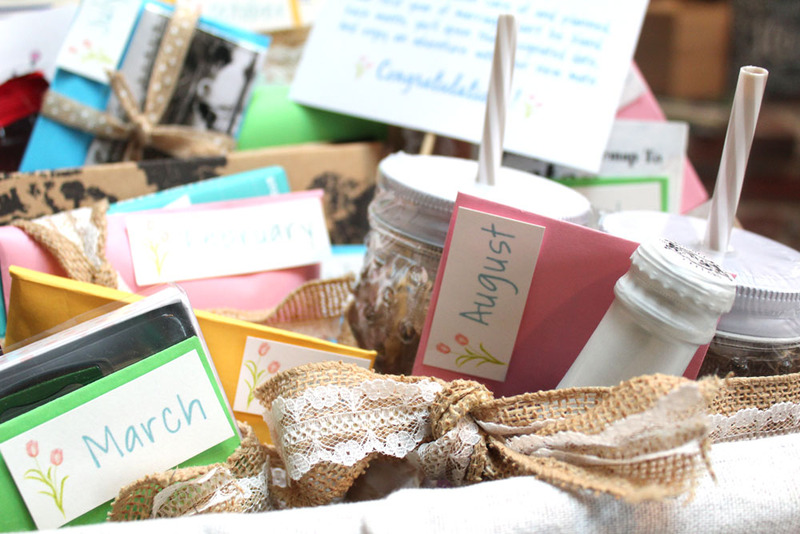 I was knee deep in decorations, games, and food planning for my sister’s bridal shower when an idea hit me. 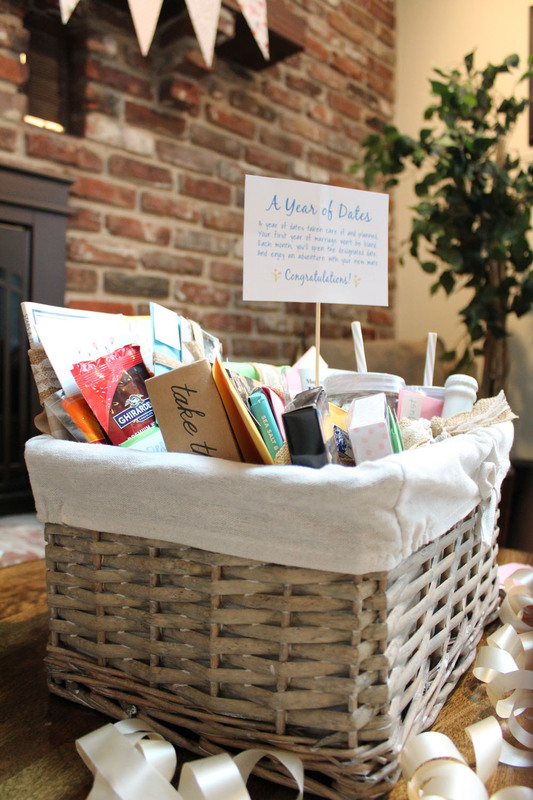 Instead of making a Year of First Milestones, I would make a Year of Dates wedding gift basket. 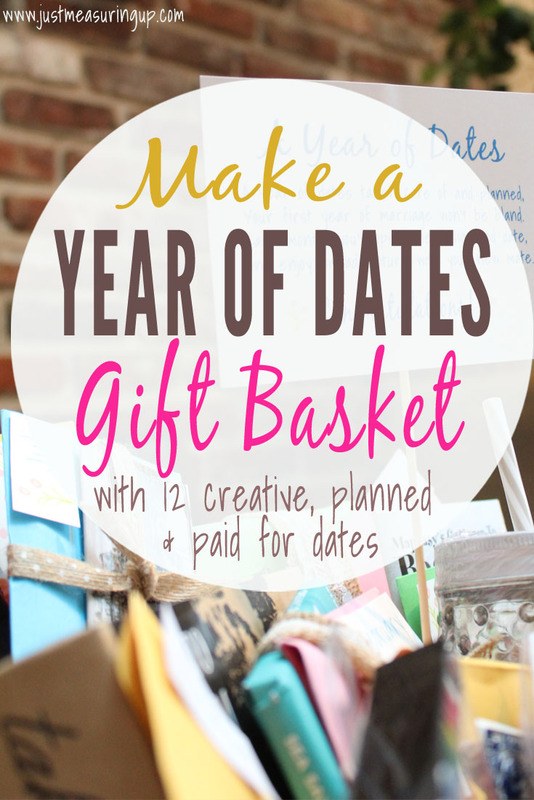 The basket would include a planned and paid for date for every month of their first married year. My sister and her fiance were always looking for new things to do in the city, and this was the perfect opportunity to make a special DIY wedding gift for them. My sisters and I always watch “The Bachelor” together. And by together, I mean we watch it at exactly the same time and send tons of group texts back and forth. So planning 12 dates made me feel a little like Chris Harrison. I shared the idea with my mom and sisters and asked if they wanted to go in on it with me. 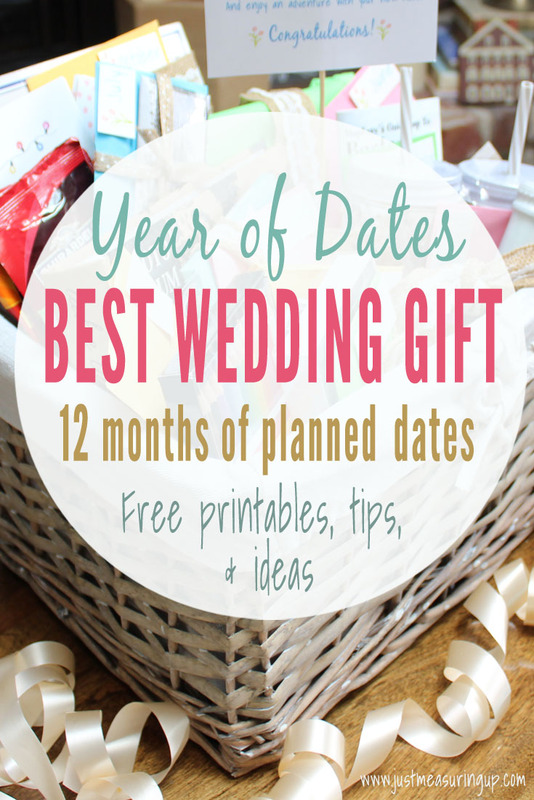 That way we could plan some really nice dates for the Year of Dates wedding gift. I was happy to hear they loved the idea. 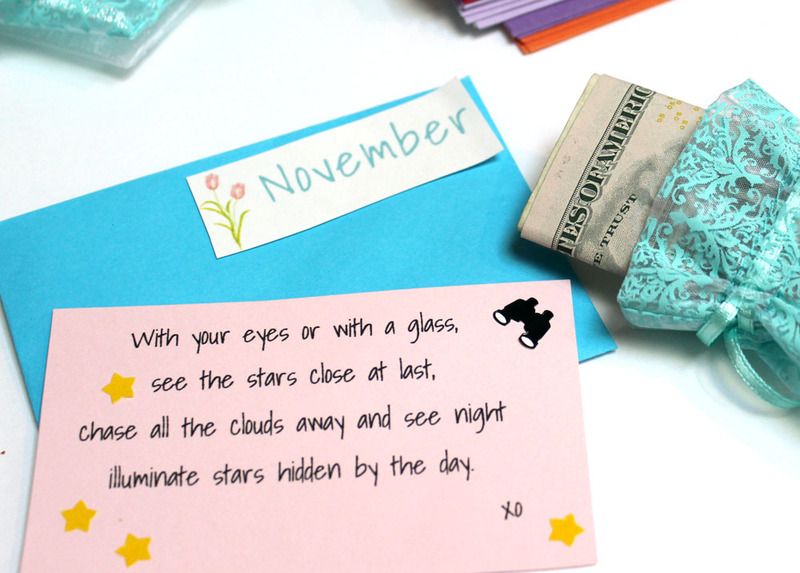 You can make the dates as expensive or inexpensive as you’d like. Or, you could vary it like we did. Some of the attractions we included were free, so we could make other dates more expensive. Once you set your budget, divide by 12 so you know around how much you can spend on each date. To make the Year of Dates gift basket, I used the following materials. The printables and templates are available for you to download too. I started by making an Excel spreadsheet to track all of the information for the Year of Dates wedding gift. I seriously am in love with spreadsheets, and this was the easiest way to organize everything. The next thing I did was start researching things to do in their city. I found lots of great blogs and articles with tons of ideas for date nights. Before I finalized any of the 12 dates, I read the reviews of the places on Trip Advisor. That’s the absolute best way to find out if a museum, restaurant, or attraction is worth the time. If you are looking for date ideas, some general date ideas are ice cream dates, movie dates, ice skating dates, tree lighting dates, beach or lake day trips, concerts, festivals, picnic dates, swimming dates, gym dates, rock climbing dates, hiking dates, bike riding trips, cooking class dates, dessert dates, sports games, and zoo dates. There are just so many possibilities. When researching the 12 dates, we stayed away from any potential idea where we had to lock in a certain date because we had no idea what their work schedules are like. So any festivals, concerts, or games were out. As soon as a date attraction/venue looked good, I added it to my Year of Dates Excel list. In putting together the 12 Months of Dates gift, my sister had the idea of putting an item or trinket with each date. So instead of just giving an envelope with the date card and money or tickets, there was a cute little trinket too. 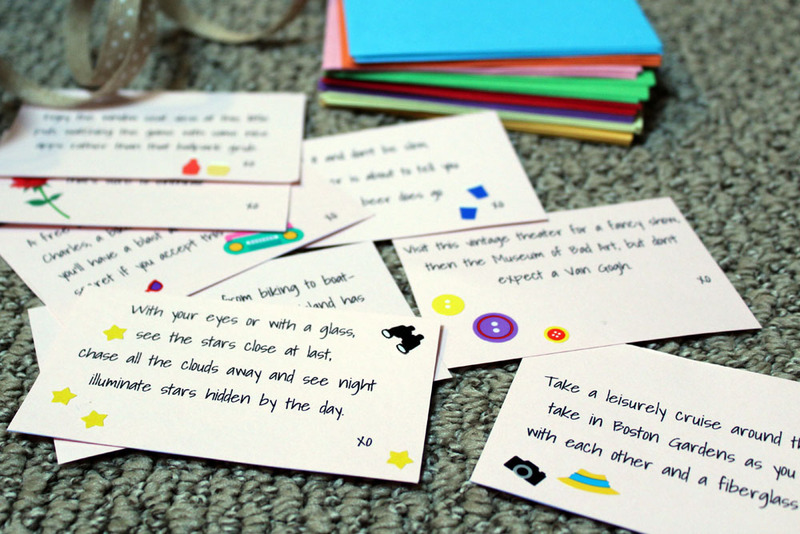 So, we creatively found items to go with each of our 12 date ideas. For example, we picked up beer cozies to go with the beer tour date. We included a pack of colored pencils and a little sketchbook to go with the art museum trip. We found a easily-foldable blanket for their picnic, cute mason jar cups with champagne to go with their beach date, and hot cocoa and hand warmers for the Christmas tree lighting. Other items we got were a fancy wine cork, magnets, star book, walkable map for their tour, photo album with a map on the cover, and a chocolate bar to go with a chocolate tour. These little trinkets can add up so I suggest going to Target’s Dollar Spot section or using a coupon at the craft stores. I love the idea of trinkets because it really made for a nice gift basket. It made the Year of Dates wedding gift so much more than envelopes of money. you’ll have a blast at this best kept secret if you accept this rose. Here we filled in the date venue, address, and website. We also included any helpful hints, such as the hours the pool was open and the availability of bathrooms/changing rooms/lockers. We used the information in the reviews on Trip Advisor to compile the Helpful Hints for each of the 12 dates. It’s the same research that I would have done if I were going there, and since everyone isn’t a crazy researcher like I am, I’m sure the helpful hints were appreciated. For as many of the dates as could, we got gift cards or tickets. Being out of town, we couldn’t pick up everything we wanted – but lots of places were able to mail us these or we were able to buy/print online. Keep in mind that since it is a year of dates, some of the dates won’t happen for several months. For those far-off dates, we tended to include cash – just in case the place went out of business or went downhill before their scheduled date. We also included cash if there were any places that we were unsure about. For example, we included a museum that looked like my sister would love it; however, we weren’t sure if she’s been there before. If she’s already been there 4 times, she might not want to return. So, we did cash for that one – and she can decide. I wasn’t sure how I was going to present the Year of Dates wedding gift. I was thinking maybe a cooler bag, and then they could use that for their picnic. However, I felt that this wouldn’t be the best presentation because you wouldn’t be able to see everything. 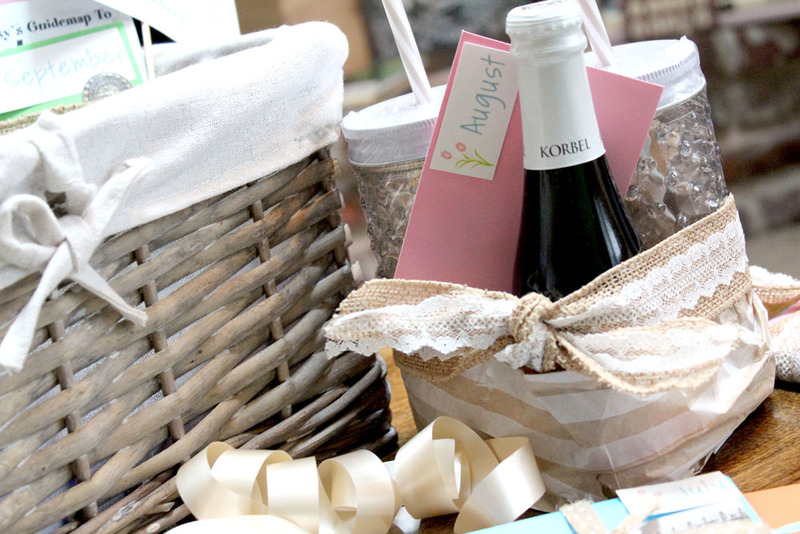 I ultimately went with a gift basket and really thick burlap lace ribbon for the envelopes and items. This gave all the assorted trinkets a uniform look. Also, I didn’t want the money or tickets to get lost. So, I bought these organza pouches. These pouches made it easy for the recipient to keep track of money or gift cards. 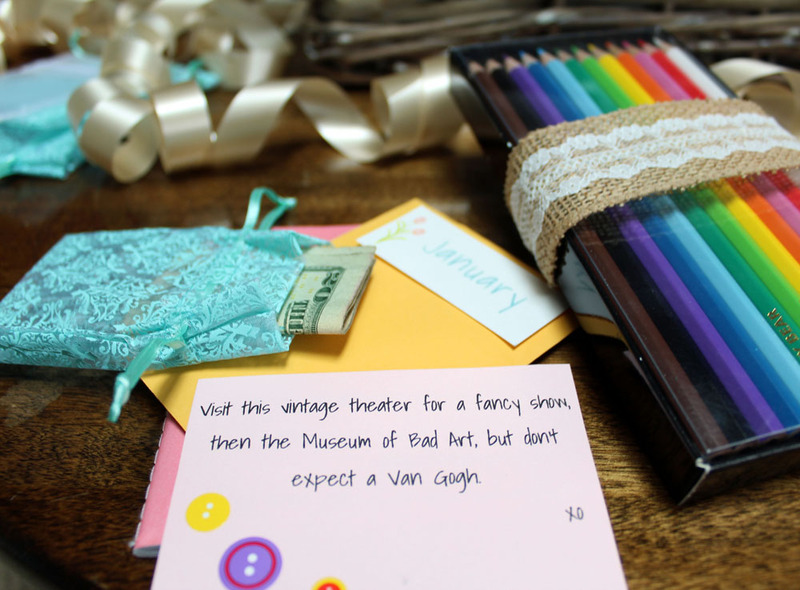 Then, I put the date card and the organza pouch in little colorful envelopes. I printed the month labels (free printables) and glued them on the cards. This also contributed to a uniform look. 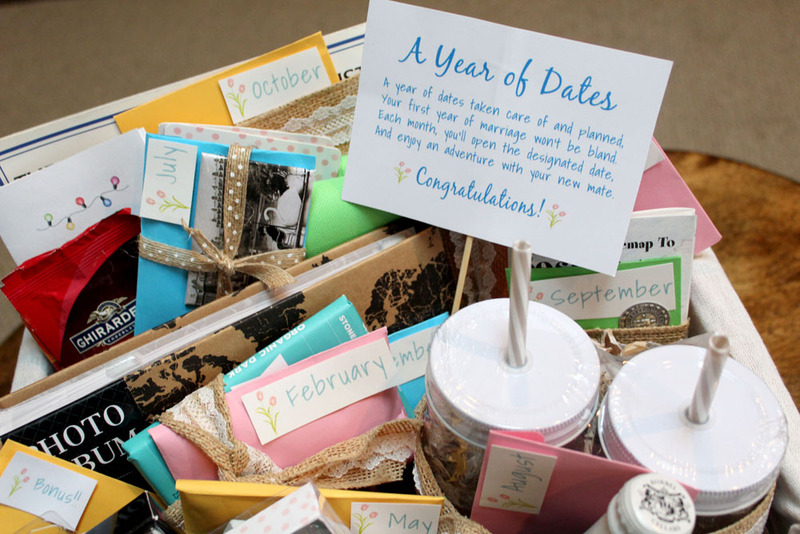 I found a nice basket at Michaels for the 12 Months of Dates wedding gift and got to work filling it up. 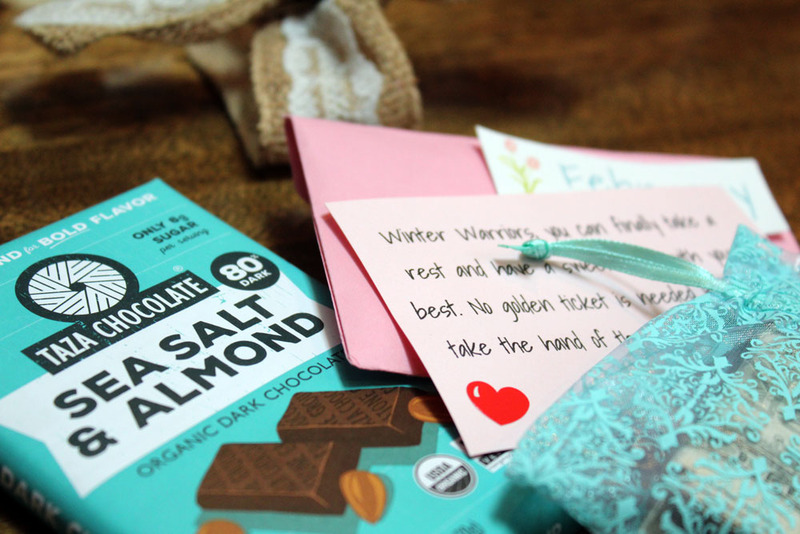 Then, I used the burlap lace ribbon to wrap around the items and then I slipped the envelope in. 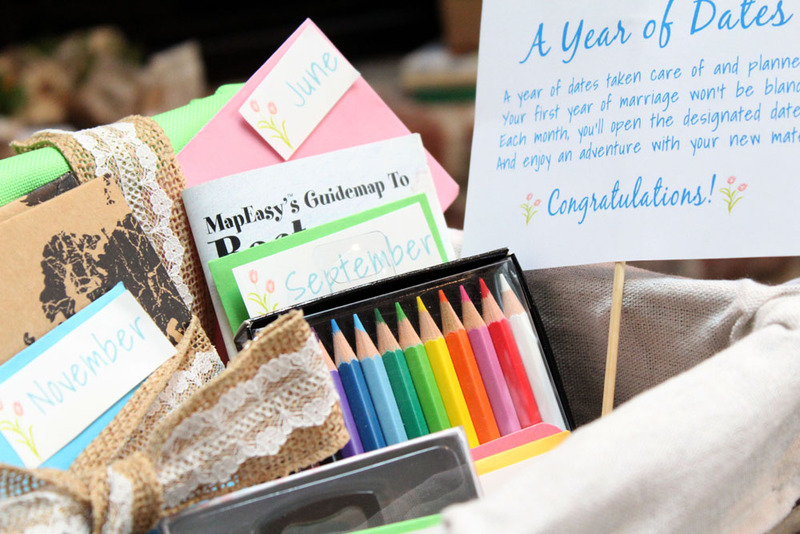 Between the monthly labels (free printable) and the burlap ribbon, it tied together all the “random” trinkets we picked up. I stuffed some tissue paper at the bottom to keep items in place. I also printed off a Year of Dates poem and taped it to a little wooden skewer. Last, when doing my research for the Year of Dates basket, I found out that you can get free or discounted passed to many places in their city through their library. 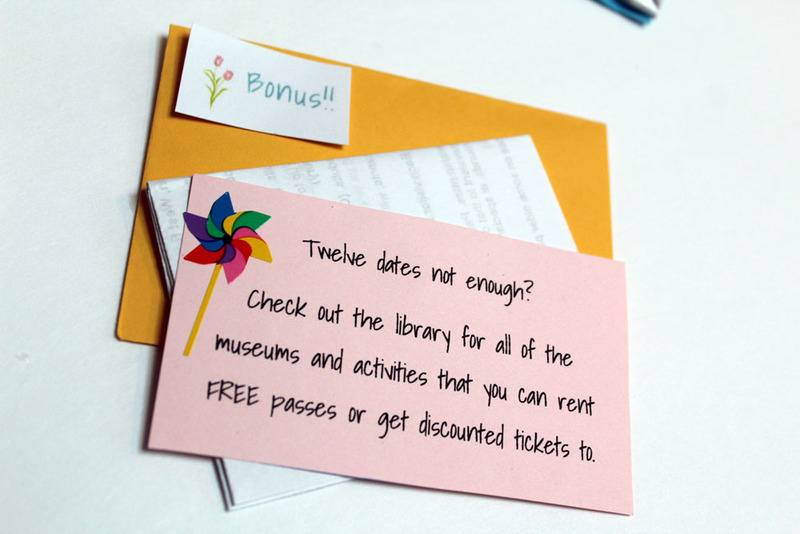 So I added a little “Bonus” date card and printed out the list of places they could go by reserving the tickets in advance at their local library. The Year of Dates wedding gift went over so well! My sister loved it so much and is excited to check out lots of new places around the town. 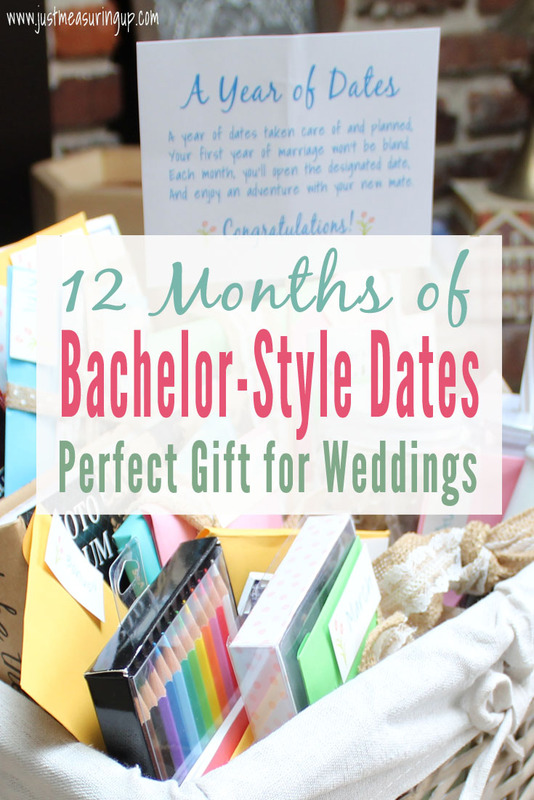 It’s such a creative gift to give 12 planned and paid for dates, and I know they really appreciated it. I love giving a gift that’s creative and shows that you put a lot of thought in.